In the original Christmas story, a bright star appears over Bethlehem attracting three wise men from the East. They traveled from far away to see what they believed was the Messiah who was just born. The arrival of the wise men was considered to be a very strong signal. This baby born in Bethlehem was a very strong to be a very strong teacher, prophet and healer. Over 2,000 years later, the signal of climate change is becoming evident from many different sources of scientific evidence, such as changes in the atmosphere, oceans, polar ice shelves, sea level rise, weather patterns, etc. Just like the prominent news in Bethlehem of wise men arriving from the East, it is getting harder to ignore the vast amount of news about climate change these days. For me, it has been fascinating how my best friend, Scott, has reacted to the news of climate change. I have known him for nearly 30 years. I met him back in 7th grade when we would eat lunch together at school and talk baseball. We still talk regularly on the phone. Since high school, our lives have gone in totally different directions. He is an auto mechanic outside of Seattle, Washington with a wonderful family. I am a single seasonal park ranger at Crater Lake. Scott has similar conservative political views as ‘Joe the Plummer,’ who became famous during the 2008 Presidential Campaign. I have become very a very progressive environmentalist with spending the last twenty years working in the national parks. We have kept the friendship strong over the years with the unspoken rule of not talking about politics. Over the years, Scott has had a lot of fun making fun of the issue of global warming. He loved to joke how he would love to see palm trees in Seattle and his home state of Wisconsin. 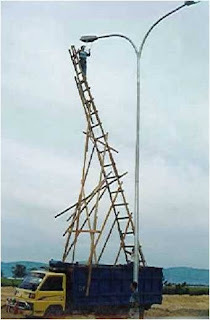 He would welcome sea level rise because he could launch his boat so much closer to the Puget Sound form his house. We would have so much fun talking about other stuff about baseball, the outdoors, music etc. However, I would have to bite my tongue so hard that it would almost bleed at times when he would make his global warming jokes. I would be staying at his house, with his family, and eating his food during these short visits. I wanted to be a gracious guest so I just did not have the heart to correct him. Finally, Scott wanted to let me know that he thought Ricky was on to something. He could not dismiss his own son and what he was learning in school. His best friend, who is a tree hugger park ranger, he might overlook on this issue from living out in the woods too long. However, it was hard to ignore his son who was coming home from school with articulate facts on climate change. Just like the town of Bethlehem noticing the original Wise Men, it was hard for Scott to ignore the Two Green Wise Men showing up in his life. As a side note, I called up Scott a few days ago to ask him if this story was true. He said it was. However, we wanted to add that he still welcoming global warming and sea level rise so he can go fishing from his house. However, Scott went out of his way to wish me all the best as I am following my passion to be a climate change communicator. His tone could not have been more supportive and encouraging. In the end, that is all you can ask for in a best friend and more. It makes me want to double my efforts even more to inspire people to resolve climate change. I am going to do all I can to prevent dangerous climate change. In the end, all the negative consequences are going to far outweigh any possibility of Scott being able to fish from his house. This entry was posted in Uncategorized on December 22, 2011 by bettling. It was one of those road trips where you are in desperate need of a restroom. It around 1 pm in May, 2008. I was driving across country from my winter job in Florida to my summer job at Crater Lake National Park in Oregon. On this day, I was driving across the World’s Loneliest Highway, Highway 50 going across the state of Nevada. There were no developments (i.e. RESTROOMS) for past 100 miles of my drive. As usual, I was drinking lots of water to keep me awake and hydrated while I was driving. However, I thought my bladder going to burst before I reached any civilization. 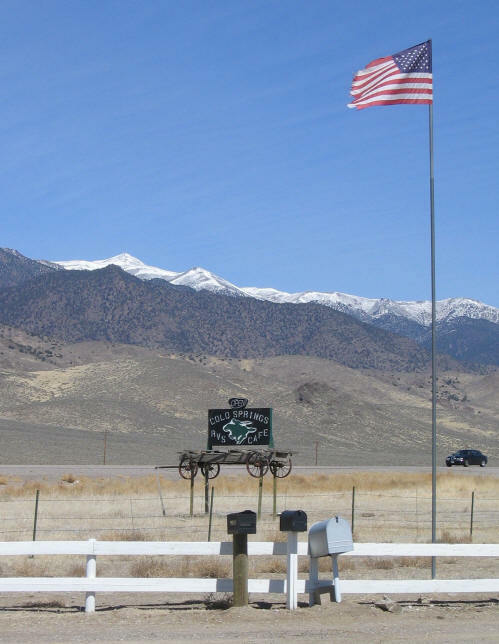 I still had around 100 miles to drive to meet up with a friend in Carson City, Nevada. 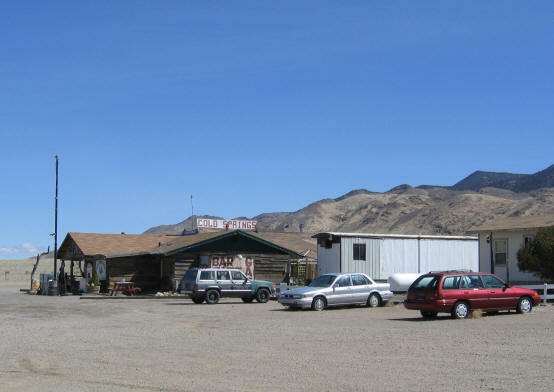 Finally, I saw a gas station/mini mart around the “blink and you will miss it” extremely tiny town of Cold Springs, Nevada. It felt like a miracle to finally see an active building that may have a restroom. I then asked the store clerk, ‘So how do you like those solar panels?’ She responded, “GREAT! We love them. We still have to go on the grid at night. However, the solar panels do provide all of our electricity during the day and we are even able to sell some of it to the electric utility.” According to Gary Reysa on his website www.builditsolar.com, the owner of the Cold Springs facility also told him that it is a 30 Kilo Watt grid tied solar photo voltaic (PV) installation that sells excess power to the utility. The owners installed the solar PV as an investment, and feel that it has paid well — they intend to install additional PV in the future. 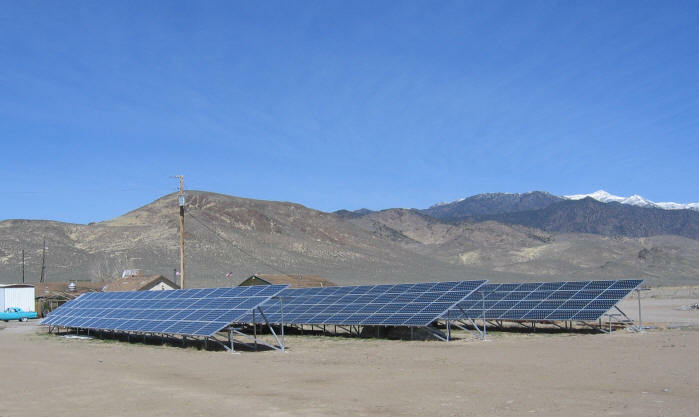 I then mentioned the solar panels at Cold Springs to my friend, Dave, in Carson City. 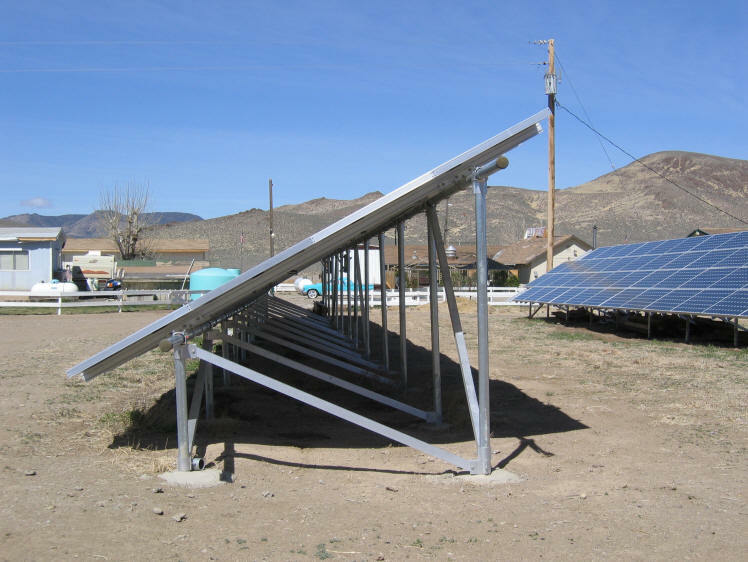 He responded that Nevada was even offering tax credits to residences at that time for those who put solar panels on their homes. I believe, Like the Cold Strings Station Motel, RV Park and General Store, there are so many more things we can be doing to be energy independent and use clean energy here in America. The problem is that often we do not notice these things, unless we really, really truly have to use the bathroom. This entry was posted in Uncategorized on December 21, 2011 by bettling. I AM GOING TO DROP A STINK BOMB ON YOU! Below is the text from a speech I presented on April 13, 2011 for St. Louis South County Toastmasters. After I mentioned just the phrase climate change in my first speech, two of my fellow toastmasters wanted to me to prove to them that climate change is caused by humans. This speech was an attempt to answer them with what I think is the key evidence that convinces scientists that climate change is caused by humans. Imagine that someone in this room passed gas right now that smelled so rancid that it interrupted our meeting. Tonight, in a sense, I am going to throw a stink bomb in the room. There is a sharp disagreement among folks in this room whether humans are causing global climate change. Like a courtroom, I propose to make this case tonight for you with the strongest scientific evidence that I know. Basically, just like a toastmaster passing gas, we are stinking up the planet with carbon dioxide. Carbon dioxide is the primary emission of our vehicle’s tailpipes and industrial smokestacks. Starting in 1959, Charles David Keeling started measuring the amount of carbon dioxide in the earth’s atmosphere. The average amount of carbon that year stood at 316 parts per million. In 1960, it reached 317 parts per million, and has steadily increased every year over the past 50 years. The alarming part is that, just like these dance partners, when the amount of carbon increased in the atmosphere, so has the average global temperature. This dance is represented on the graph below by the red line for carbon dioxide and the blue line for average global temperature. It has been going on for throughout Earth’s history, as you can tell by this graph of measuring the ice cores from Antarctica going back over 400,000 years. Today the amount of carbon dioxide in the atmosphere stands at 391 parts per million. This represents a thirty percent rise since the industrial revolution in 1750. The key question or stink bomb is:IS THIS JUST CYCLICAL OR PART OF A NATURAL CYCLE? At 391 parts per million, according to scientists, is the highest amount of carbon dioxide in the atmosphere, not only in the past 400,000 years, but in the past 25 million years. If we do nothing to curtail our carbon dioxide emissions, by the year 2100, amount in the atmosphere will be insanely around 621 parts per million. 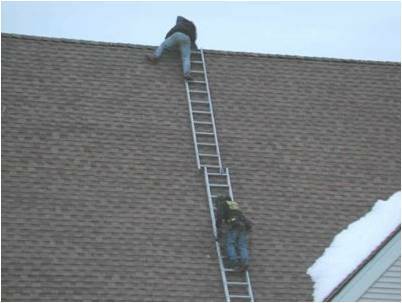 To me, that totally seems like a very stinky and unacceptable situation, like these different gentlemen working on these ladders. How do we know that this stinky carbon dioxide is not increasing naturally from volcanoes or the ocean? Crime suspects on TV shows, such as CSI, leave behind DNA evidence pointing to their guilt. Carbon dioxide also has DNA evidence, known as isotopes that point to the guilty party also. Isotopes are defined as atoms that contain the same number of protons but a different number of neutrons. Like a police lineup, carbon dioxide molecules appear in three isotope forms, Carbon 12, which makes up 99 percent of all carbon on earth. Carbon 13 which makes up around one percent and Carbon 14 which makes up around point zero one percent. We can eliminate carbon 14 from the line up because this carbon is actually decreasing from measuring tree ring radioactivity. Image source: Michael E. Mann & Lee R. Kump, Dire Predictions: Understanding Global Warming (DK Books) 2008 , page 35. Carbon 14 is actually highly unstable or radioactive. This form of carbon only lasts over around thirty thousand years before it decays into Nitrogen 14. Carbon 14 appears naturally in the earth’s radioactive atmosphere and is absorbed by plants and us. Volcanoes, the deep ocean and fossil fuels, such as oil, natural gas, and coal, are free of carbon 14. Why? They all have been buried deep in the earth for hundreds of millions of years. Even more, when plants photosynthesize, they love or have a sweet tooth for the Carbon 12 form of carbon dioxide. Fossil fuels, such as coal, oil and gas are basically depleted of Carbon 13. 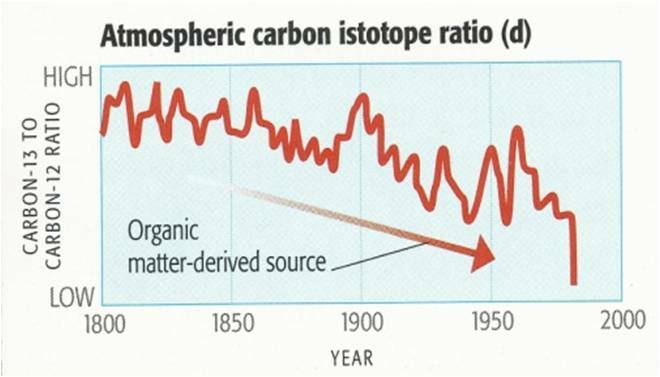 Thus, when fossil fuels are burned they release vast amounts of Carbon 12 in the atmosphere. 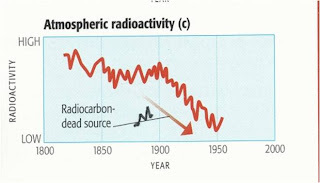 Therefore, scientists have quantified that the atmosphere has become less radioactive over time and the ratio of carbon 13 to carbon 12 has been steadily decreasing also with these two graphs that I am showing you. Confused? Here is the clear bottom line. If this was a murder trial, our crime scene FBI experts would be would be saying that the carbon from fossil fuels are the guilty party, not natural sources, such as volcanoes or the ocean. 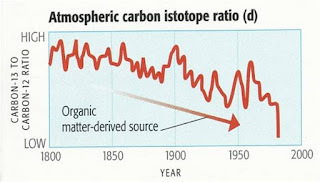 Over geologic time, increases in carbon dioxide almost always caused increases in the average global temperatures. Since humans are the only suspects in burning fossil fuels, we are basically the ones who are stinking up the place. Mr. Toastmaster, fellow Toastmasters, and distinguished guests, I appreciate you allowing me to share my knowledge on the threat of climate change. I hope I did not stink up the joint. If we can find a way to reduce our dependence on fossil fuels, I am convinced it will be a healthier planet. Future generations may even thank us for not stinking up their planetary home. Even more, keep an eye out on your neighbor who may yet pass gas tonight or at a future Toastmasters meeting. Mr. Toastmaster. This entry was posted in Uncategorized on December 20, 2011 by bettling. I love baseball, especially the St. Louis Cardinals, and my deep passion is climate change. I had two very different experiences recently meeting the most recent World Series MVP and America’s most renowned climate scientist. Both experiences were a thrill of a lifetime. Both experiences also speak volumes about America’s priorities, especially when it comes to celebrities, sports, science and climate change. November 22, 2011 was my first day of work this winter at the St. Louis Science Center. I was scheduled to leave at 5 pm, but I could not leave any earlier because my boss wanted to show the proper way to close. I did not leave work until 5:15 pm. I was totally in a rush to leave because the newspaper kept advertising that St. Louis Cardinals World Series MVP, David Freese, was signing autographs at the FVE video store, less than 2 miles from the Science Center at 5 pm. Without mentioning it to my boss, I bolted out to leave as soon as she released me for the day. I then drove straight to FYE to try to get an autograph. The traffic was jammed driving to FYE. It took well over 15 minutes, in what should have been a five minute drive. There were even two minor car accidents on the way to FYE. Apparently local Cardinals fans really wanted to see David Freese. Oops. It looks like this drive is going to be for nothing. It felt like such heart deflating disappointment. I was not going to meet David Freese. However, I am very tenacious, very stubborn, and overly optimistic. I walked over to the barriers just to try to get a glimpse of David Freese. At 5:50 pm, the autograph line was down to just a handful of people. I noticed a friendly store clerk, John, who was watching the end of the line for security reasons, slip a few more people into the line to get David’s autograph. I respectfully and meekly asked John, “If I buy the DVD, will you still let me slip in line to get David’s autograph.” Very surprisingly, John said, “Yes” to my request. I then ran to the cash register with the DVD, plopped down my credit, ran back to where John was holding a place at the end of the line for me. I then got David to sign my DVD and get my picture taken with him. Out of the hundreds of people who showed up that day, I was the last one to get David Freese’s autograph. I felt like I had just lived an amazing Indiana Jones-like adventure to obtain this autograph. Exactly two weeks later I was attending a lecture about communicating the science of climate change at the American Geophysical Union Conference in San Francisco. While I was listening intently to the lecture, a friend I met at the conference, Kaitlin Alexander, slipped me a note that Dr. James Hansen from NASA was speaking at 12:30 pm. He is considered to be one of America’s top climate scientists. He is a huge hero of mine, and I never thought it my wildest dreams I would be able to meet him. This was in such striking contrast to when I stood in line in November with hundreds of people to wait over an hour & pay $27.95 to get the autograph of local World Series baseball hero, David Freese. There was even horrible traffic and a couple of minor car accidents for people to race to see this baseball player. Granted, Dr. James Hansen is a diehard Yankees fan, so he might understand my deep love for baseball & meeting the stars. On the other hand, this shows how upside down our priorities are as a society. When are we really going to hold scientists with great esteem & respect and stop idolizing music, pop, movie and sports stars to an insane level? WHO WOULD I CHOSE TO MEET AGAIN? David Freese grew up in St. Louis and will now be a local legend here forever for his crucial hits to enable the Cardinals to win the 2011 World Series. On the other hand, people worldwide will never forget all the efforts of Dr. James Hansen for alerting the world on the dangers of global warming since the 1980s. Baseball fans will always be entertained by the stories of David Freese rising to the occasion as a World Series hero. If humans find a way to resolve climate change, future generations will look Dr. James Hansen as one of the biggest heroes of the planet. By the way, with my passion for climate change, if I had a choice to meet David Freese or James Hansen again, I would very easily pick James Hansen. I would love for another opportunity to talk baseball with him and pick his brain more about the science of climate change. This entry was posted in Uncategorized on December 18, 2011 by bettling. Climate change can be a daunting and scary subject for a presentation to strangers. You may then wonder how on Earth you are going to keep an audience engaged and inspired on such a serious topic. I have been giving presentations on climate change for over a year now as a park ranger and public speaker. Let me share with you my 5 tips on how to do effective climate change presentations. 1. BE LIKABLE. Look for those ways to establish rapport with your audience. At my ranger talks, I always try to arrive about 30 minutes early to get to know the early arrivals in my audience. The top advice you always here for public presentations is KNOW YOUR AUDIENCE. However, do you do this? I chat with the audience members who arrive early by asking them where do they live, how did they hear about the program, what they did today, etc. By establishing connections with the early arrivals, they will become friendly faces in the crowd, providing even support and an open mind to your ideas. 2. BE ENTHUSIASTIC. Ralph Waldo Emerson was so correct when he stated, “Nothing great was ever achieved without enthusiasm.” If you are not excited about climate change, how will your audience be? Even more, if you are not about the solutions, especially the ideas of sustainability and hope, how can your audience get excited about this? Genuine enthusiasm is contagious. Dower is depressing. I know I just gave a great presentation when people come up to me and say, “I love how positive and enthusiastic you are.” I love baseball and I feel like I have hit a home run whenever I hear audience members say this to me. 3. BE CREDIBLE. Know your subject well. It is hard for them to question your knowledge if you have really done your homework. The greater amount of research you have put into your subject, the more confident you will speak about it also. If you have really researched your subject and feel strong confidence speaking about it, the greater that your audience will trust what you are saying and think of you as an authority. 4. BE FUNNY. Find some way to naturally incorporate humor into your program. As science fiction writer Isaac Asimov once remarked, “Jokes of the proper kind, properly told, can do more to enlighten questions of politics, philosophy, and literature than any number of dull arguments.” I cannot tell you how to be funny. To paraphrase E.B. White, ‘Analyzing humor is like dissecting a frog. Both die in the process.’ However, if you can find some natural humorous way to share funny stories, images, or analogies, then your audience will more likely stick with you on what they perceive is a heavy subject like climate change. 5. BE HOPEFUL. A friend of mine just returned from a presentation by Project Ocean. That speaker stressed the point that when people hear they have cancer, they do not research the molecular biology of cells. They want the solutions now on how they can fight cancer successfully. Is it exercise, diet, meditation, prayer, medication, surgery, sense of humor, or anything else Doctor? The huge planetary problems associated with climate change can be very scary for your audience to comprehend. What is your solutions for them? John Lennon once said it best: “There are no problems. Only solutions.” You got to believe that. In December 2010, Matthew Feinberg and Robb Willer at the University of California Berkeley published research paper, Apocalypse Soon? : Dire Messages Reduce Belief in Global Warming by Contradicting Just-World Beliefs. The researcher conducted two experiments on 97 UC Berkeley undergraduates to gauge their political attitudes and skepticism about global warming. The study concluded that “Fear-based appeals, especially when not coupled with a clear solution, can backfire and undermine the intended effects of messages.” In other words: GOT HOPE? I think it is so important to maintain those childlike qualities of wonder, fun, and hope as we engage people people with presentations on serious issues like climate change. This entry was posted in Uncategorized on December 17, 2011 by bettling. 3 Things You Can Do to Fight Climate Change Right Now! What are 3 Things You Can Do to Fight Climate Change Right Now! 1. DO WHAT YOU CAN TO REDUCE YOUR CARBON FOOTPRINT. (buying local, eating organic, vegetarian, weatherizing your home, buying secondhand, carpooling, using public transportation when possible, unplugging appliances, refusing paper & plastic bags at the grocery store, not buying bottled water, turning the thermostat, etc.) According to science teachers that I talked with, all these little things do add up and make a difference. Besides, the undecided and skeptics need to see that we are walking the walk. If I can relate a story, both John Cook of Skeptical Science and I have had similar experiences of our dads being skeptics for years, then one day sharing with us that they accept the science of climate change. My dad still listens to Rush Limbaugh. However, by my love, presence and dedication, he accepts that climate change is real and he is very encouraging of my path to educate others on this subject. 3. STAY HOPEFUL. Even if the scientific future projections are extremely scary and daunting, please remain hopeful! I recently heard Susan Hassol, Director of Climatecommunication.org speak at the American Geophysical Union Conference in San Francisco. During her presentation, she stated that “Most people will find it difficult to accept the science of climate change if they feel there is no solution.” She was citing the December 2010 research paper, Apocalypse Soon? : Dire Messages Reduce Belief in Global Warming by Contradicting Just-World Beliefs by Matthew Feinberg and Robb Willer who uncovered this eye-opening finding with experimental studies on 97 Berkeley undergraduates. Susan Hassol also explained to me by e-mail today “that people who believe in a ‘just world’ have trouble accepting something that is hopeless.” The study seems to show that dire messages without providing hope are likely to backfire. Too much emphasis on doom and gloom without providing hope can influence people to be even more pessimistic about climate change and the science that supports it. This entry was posted in Uncategorized on December 15, 2011 by bettling. Below is the text from the speech I gave at the St. Louis South County Toastmasters meeting this evening. The speech went fabulous. The other Toastmaster members voted me as the “Best Speaker” for the evening. I talked about how weatherizing your home can save lots of money. It was a climate change speech aimed at an audience with a lot of skeptics of climate change. I spoke to my audience in a way they could relate resolving climate change. I sold them on how reducing your carbon footprint (without using that term) can save you cash (not to mention saving the planet). Kermit the Frog was wrong: It is actually easy, as a matter of fact, very easy to be green. Often times when you hear people talking about conservation or environmental issues as “green issues.” This is because the color green reminds us a lush green forest or mountain meadow in nature. Most people, they will tell that they try to be green by recycling, not littering, and paying attention to green issues. However, it seems that people have a hard time taking actions beyond those basics. They believe they have to buy a hybrid car, buy organic fruits and vegetables, or weatherize, which they consider to be too expensive. Tonight we are going to talk about why MAKING CHANGES TO REDUCE YOUR HOME ENERGY COSTS IS GREEN.. I am going to show you here tonight that unlike Kermit the Frog It is Easy and Fun to be Green. First of all, who here in the audience has switched their light bulbs from incandescent to compact fluorescent light bulbs (CFL)? Why did you do this? 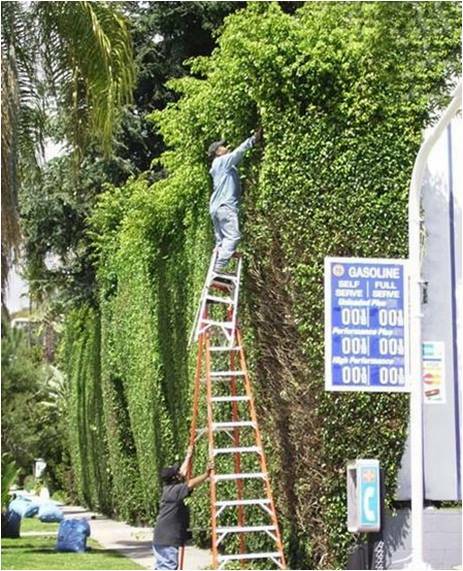 Because switching your light bulbs save you a lot of money in the long run. According to Homedepot.com, CFL will use around 75% less electricity than an incandescent bulb with the same light output, while lasting about 10 times longer. Additionally, since CFLs produce less heat, they can help you save on cooling costs in the summer. The bottom line though is that if you Replace 3 frequently used light bulbs with compact fluorescent bulbs and you could save around $60 per year. 1. Adjust your TV mode from “retail mode” which enables TVs to have the best quality mode under bright showroom lights to “home mode,” which is fine for most types of viewing. Average yearly savings around $45. 2. Pay a qualified heating and cooling pro to seal and insulate heating and cooling ducts that run through your home. Average yearly savings around $400. 3. Unplug those voltage vampires, such as your DVD player, microwave oven, computer, TV, cell phone charger, and Hello Kitty toaster (which I know ___________ uses with pride very morning). Average yearly savings around $125. 4. Stop pre-rinsing dishes before you put them in the dishwasher. Believe it or not, your dishes come just as clean, and it is an unnecessary waste of time and energy. Ultimately, the yearly savings is $75. 5. If you can wash your clothes in cold water. If you are worried about removing tough stains, Consumer Reports recommends Tide 2X Ultra for Cold Water. Even if this Tide detergent is twice as expensive as other detergents, Consumer Reports thinks you could receive an average yearly savings of $60. 6. Lower your water heater from 130 degrees to 120 degrees and insulating your hot-water pipes could save an average yearly savings of $15. 7. Insulate your attics, basements, and other key areas could save the average American household up to $191 a year. And I have heard that it is a lot greener down there in January with all the palm trees than it is in St. Louis. I know what you are thinking right now: Brian, I do not have the time to make all those adjustments to my home to make it more energy efficient. Your neighbor might be making these changes already. I found an article this on May 13, 2011 on the ClimateCentral.org, To Save Energy, Utilities Tap into Our Competitive Instincts by Nicole Heller. The article reported that City of Palo Alto, Calif. recently began including Home Energy Reports in residential utility bills to empower their customers save energy and be greener. Each report compares a household’s energy use with their 100 closest neighbors in homes of similar sizes, and also provides targeted energy conservation tips. The bill reported that the author, Nicole’s energy bill was “ranked as the 23rd-most-efficient household in the neighborhood, based on the previous month’s electricity and natural gas use.” They were listed in the good, but not the great category. Nicole and her husband wanted to be listed in the Great category, so they immediately dusted off the caulking gun that had been sitting for over two years. This couple then spent the next two hours caulking the windows and weatherizing their home. They then waited patiently for their next utility bill. To their excitement, they were now classified as “Great,” having moved up in the standings to become the ninth-most-efficient house among their neighboring peers, and saving about $50 per month relative to the average household, or about $600 a year. Just think if you decide not to weatherize, your neighbors might just thumb their nose at you. Tell you that you stink. Or, even call you an energy hog. And you know Howard, that GREEN IS $GREEN$. Becoming more energy efficient can save you a lot of money. Again, Kermit the Frog, for all of his cuteness has it wrong. It is easy and fun to be green. This entry was posted in Uncategorized on December 1, 2011 by bettling.